We’ve all been in this situation; last minute relatives and friends pop over unannounced during the holidays. You scramble around in the kitchen thinking of what you can make without having to step foot outside to buy more stuff. The answer is this! If you have a basic pantry, use those canned beans or dried lentils. I love using red lentils because they cook up fast and you can still flavor them however you like. For this recipe, I’m using cumin in the cooking water to add a subtle spice. If you have canned beans (chickpeas and white beans work great), you can sub out the lentils and use two 15-ounce cans instead. After the lentils are tender, I blitz them with loads of fresh herbs. Pretty much anything in the fridge will work. I used a mixture of dill, mint and cilantro in mine, then a big squeeze of lemon juice and fresh garlic. Find some pretty vegetables to chop up and serve them up on a platter. Healthy and comforting, the perfect holiday entertaining dish. After living in NYC for over 10 years, I can still say I'm a Californian at heart. On my last trip out west, I spent the weekend with friends in Ojai. The beautiful valley is surrounded by hills and mountains and if you're lucky enough, you'll catch a family of quails running through. Hiking up in the hills that overlooked orange groves gave me a sense of peace and tranquility. I returned inspired by the dry heat, varieties of cactus, channeling hippie chic vibes. Crystals were vibrating in my pockets. I swung by the farmer's market, where baby asparagus and fiddlehead ferns jumped out at me. If you haven't seen fiddleheads before, they look like little green snails with baby ferns tucked inside. They're only around for a short time, so pick up a basket if you have the chance. You can cook them like you would asparagus, grilled or sautéed are ideal. This first dish is perfect for a warm day and can be served as an appetizer or veggie side dish. 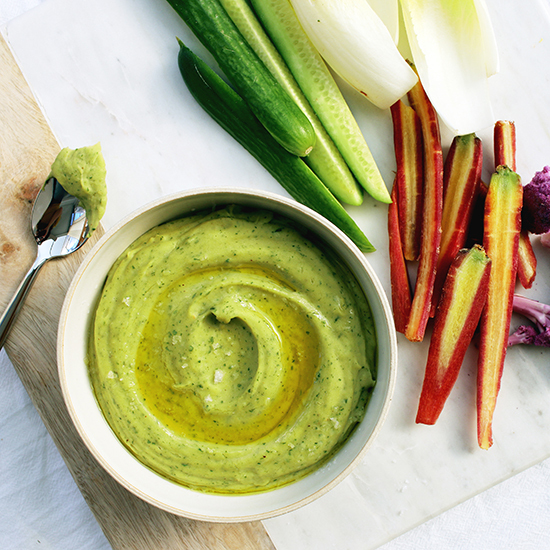 Try making the ayocote hummus ahead of time and top off with grilled vegetables. And don't forget a dusting of coffee and chia for a little earthy Ojai magic. A platter of colorful shaved veggies is a refreshing alternative to a green salad. The key to this dish is shaving your vegetables thinly on a mandoline and letting it marinate in the dressing for 15 minutes before serving. You should end up with a crunchy, flavorful salad that is perfect to accompany a main dish. It also makes a great healthy lunch when tossed with prepared grains such as quinoa.